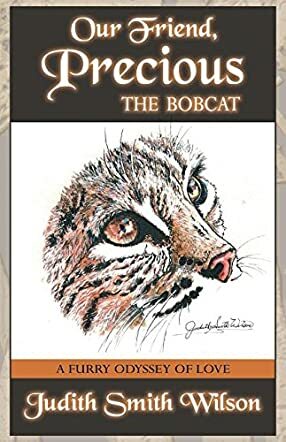 Our Friend Precious, The Bobcat by Judith Ann Smith Wilson is a true story that follows the lives of Judy and Gene after they move their family to a small town near San Diego. Their new house gave them all the space they needed to bring up their children, two cats, and a dog. They joined the National Exotic Cats society in the hopes of learning more about the bobcat. One day, they received a call from a friend to say that an injured bobcat had been found. On picking up the animal, they saw it had a collar on and had been declawed – clearly a pet. They called her Precious and welcomed her to their family. Precious was with them through thick and thin, through divorce, illness, and through the happy times as well; twenty years together taught them all a lot. This is also Precious’ story as well, so open the book and follow Gene, Judith, and Precious on their wondrous journey. Our Friend Precious, The Bobcat by Judith Ann Smith Wilson was an amazing story. What an opportunity they had to study and to live with one of these beautiful creatures, to learn first-hand about caring for her! I thought the book was very well written, in such a way that made it very easy to follow and understand. I loved the addition of all the photos throughout the book and the handwritten memoirs at the end and, yes, I confess to having a good sob at the end of it. This is the kind of book that everyone should read to learn more about the nature that we are slowly destroying, and the animals that will soon become extinct if we don’t take care. I applaud this family for taking on the bobcat and for the work they did. Thoroughly enjoyable book!